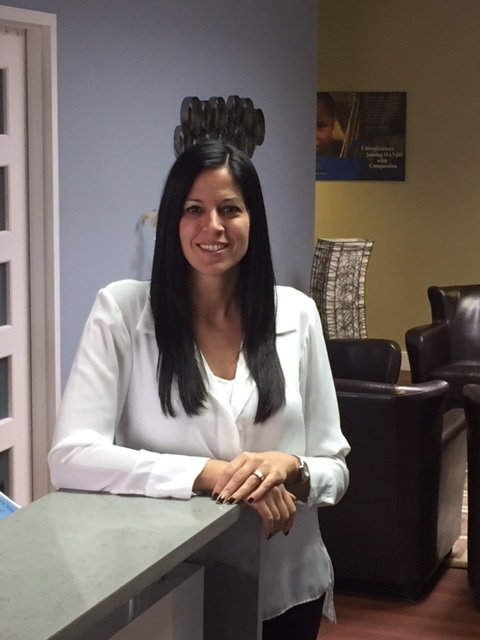 Dr. Jennifer Meret was born and raised in the Windsor area. After completing her honours in biology at McMaster University in Hamilton, she attended National University of Health Sciences in Illinois where she received her Doctor of Chiropractic degree. After being away from Windsor for 8 years she decided to return to Windsor and began practicing. She has been in practice for over 15 years and has been enjoying every minute of it! From an early age Dr. Jennifer Meret knew that she wanted to work in the healthcare field. She wanted to help people in her community live a healthy and fulfilling life. When she discovered chiropractic, it seemed like a perfect fit. After having experienced chiropractic, which helped her with her headaches, she never looked back. Chiropractic was the only way to go! Dr. Jennifer Meret’s passion is not only to help those in pain but also in helping people have a healthy spine and nervous system, allowing their body to be as healthy as possible. She also is passionate about educating the public on chiropractic and the potential we all have in us. She has done outside lectures, screenings, and you may have even heard her on AM800’s Experts on Call. Dr. Jennifer Meret’s mission is to provide chiropractic care to as many families as possible so they can maintain their optimal health potential – naturally! You can find us on our Facebook page here!